We’re honored to have Ben Stapley guest posting for us today. He is the Video Director at Liquid Church — and he’s a fantastic, multi-talented leader! Ben provides oversight and leadership for a wide variety of areas at his church. 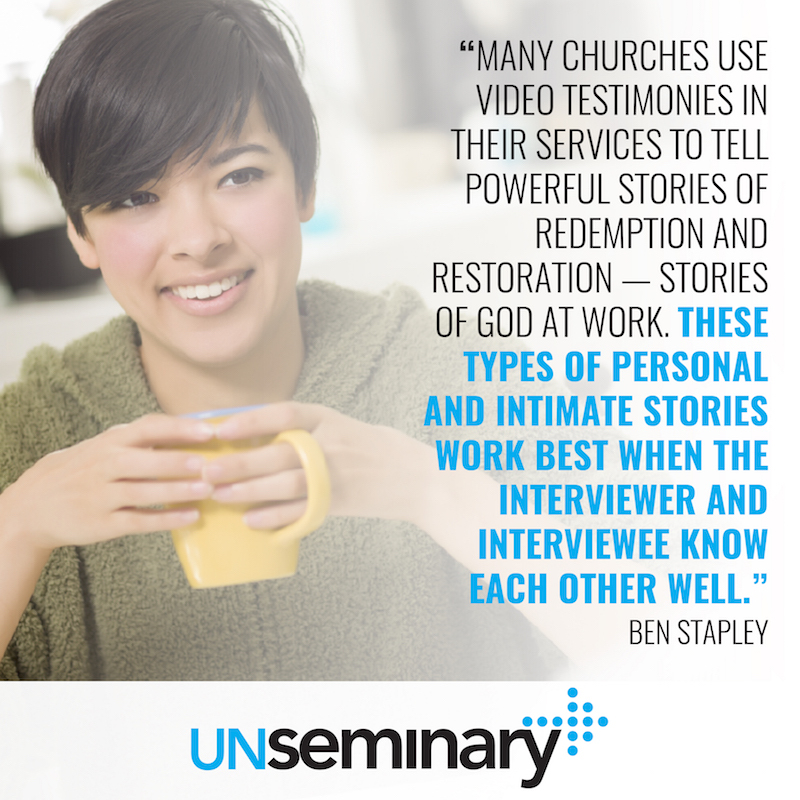 Many churches use video testimonies in their services to tell powerful stories of redemption and restoration — stories of God at work. These types of personal and intimate stories work best when the interviewer and interviewee know each other well. Having a friend conduct the interview allows for authenticity and vulnerability. But often a friend isn’t experienced in this craft. Below are a number of helpful suggestions to train and prepare unseasoned interviewers. Explain that the video of the interviewee’s powerful story will be shared in the service and online to reach as many people as possible. Sharing this upfront helps avoid the possible shock of the story living beyond Sunday. Explain that these videos are edited up until the last minute, so they won’t be able to see the video until the Sunday services. This helps avoid a possible veto at the last minute. Take notes during the pre-interview to get a detailed picture of their story. Use your notes to craft your final questions and the anticipated responses. The notes and questions are helpful if plans change and someone else has to conduct the recorded interview. Ask a peer to look over your storytelling (questions and anticipated responses) for feedback. PRO TIP: Do not give the finalized questions to the interviewee. If you do, they might try to memorize their answers and you will lose the feeling of spontaneity. Discuss where (home, work, outdoors) you will shoot the interview. Select a location where the interviewee feels comfortable and that isn’t noisy. Also, choose a location that visually connects with their story. Discuss what footage or b-roll you can shoot (family interaction, serving at church, connecting in a small group) that visually tells their story. Ask for additional personal footage or photos that work with the story. PRO TIP: Develop a curation process within your church to gather these stories. Having a list of potential stories allows you to respond quickly when a message topic changes at the last minute. Try to keep the interviewee out of the recording room until everything is set up. Having them sit in the interview chair while the gear is being set up creates unnecessary anxiety. PRO TIP: Remind them that this isn’t a “live” interview so they can repeat the answers if needed. 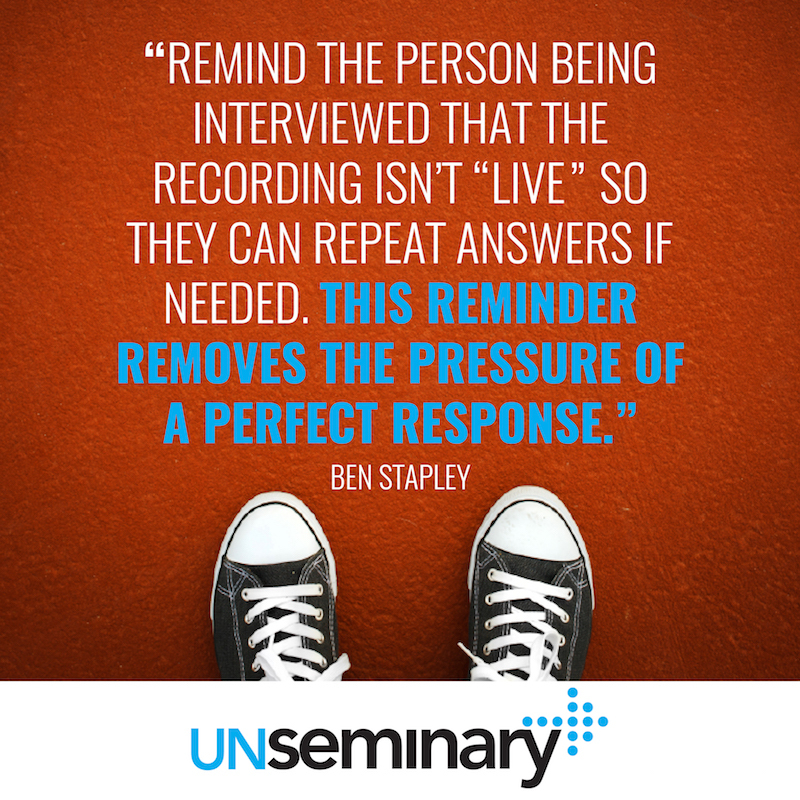 This reminder removes the pressure of a perfect response. Also, explain that the footage will be edited so they sound clear. This is another confidence booster. Let them know you won’t give verbal feedback but you will nod to indicate you are engaged with what they’re saying. 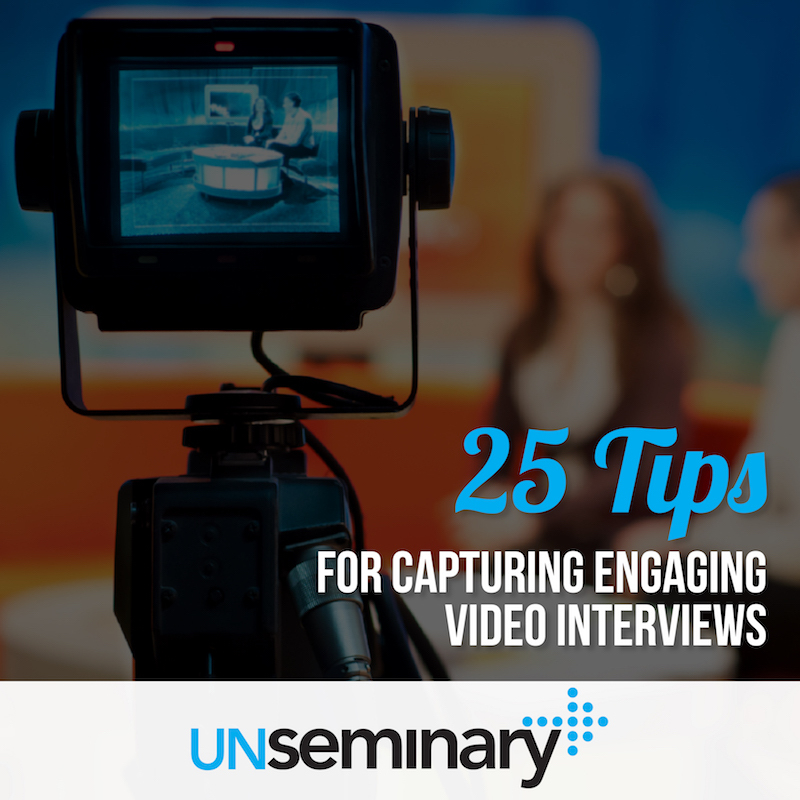 Ask them to keep eye contact with you — not the lens or videographer — during the interview. Ask them to incorporate your question into the answer. Pay attention to the interviewee incorporating your questions into their answers. If they forget, politely interrupt and ask them to try again. Start with a couple of “throwaway” questions. This allows the interviewee to warm up and relax. Communicate enthusiasm and involvement in your subject. They want to know that you like them and are interested in their story. Smile and nod. Your non-verbal cues will help them open up. Listen. A common mistake is thinking about the next question while the subject is answering the previous one, to the point that the interviewer misses important information. Follow up on what you hear. Be willing to go off script with new questions in response to new information. Great content is uncovered this way. After you finish your questions, ask them what they would like to add. This unscripted content is often the strongest material you will gather. There are two types of interviewees: ones who give brief answers and ones who give long answers. Ask open-ended follow-up questions (explain, describe, tell me more, etc.) for those who are brief and ask recap questions (let’s condense that, give me an overview, etc.) for those who go long. PRO TIP: Instead of starting the interview by asking the videographer if they are ready, ask the videographer to tap you on the shoulder when they are ready. If you use this tip, you can seamlessly move from small talk to your actual questions. When done well, the interviewee doesn’t even know they are being interviewed. Thank them for participating and pray with them. Whenever someone steps forward to proclaim the work of God in their lives, Satan also steps forward to try to undermine that work. Commit to continuing to pray for the interviewee for a month following the interview. About Ben // Over the past 15 years, I have created and captured memorable moments and media for individuals, non-profits and corporations around the globe. Some of the fields that I have worked in include teaching, videography, photography, stage design, radio, reporting and producing. I received a BA in Video Communication from MBI in Chicago. After graduating, I worked in Toronto as a television reporter and producer for Context, a national news program. In 2011, I received my MDiv from Biblical Theological Seminary. In 2016, I began working for Liquid Church in New Jersey as the Video Director. I live in beautiful Hunterdon County, NJ, with my wonderful wife, Rose, and our lovely daughters, Violet and Scarlet.